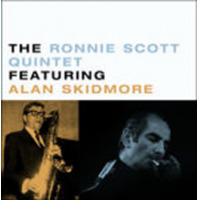 bebop spoken here: LP Review: The Ronnie Scott Quintet Featuring Alan Skidmore. Given the line-up, comparisions with the Jazz Couriers are inevitable but not obvious. The Scott/Hayes group have, in my view, never been surpassed as the front runners of British modern jazz. The presence of Skidmore gives this band a more contemporary approach to which even Scott indulges in, albeit possibly with an if you can't beat 'em join 'em approach. Conversely, on the ballad Where Are You?, Skidmore displays a maturity worthy of his father, Jimmy Skidmore. The rhythm section is impeccable, Gordon Beck, an all time piano great, who would go on to work with Phil Woods, is well featured. Jeff Clyne, who also played in the Couriers, was, until his death in 2009, a first call bassist and Johnny Butts, ex Emcee Five and Dankworth Big Band, was well mourned, not just on Tyneside but throughout the jazz world, when he was killed in a motorbike accident only 8 months after this session. A good record to add to any collection particularly as, after the Couriers, Scott isn't as well represented on disc as he should have been. As the sleeve notes remind us, he hated recording. Fortunately he was less averse to radio broadcasts and this LP sees him in fine fettle alongside the emerging talent of young Skidmore. Soundwise it's a little on the 'bright' side but not enough to mar the pleasure of hearing these giants of whom, sadly, only Skidmore remains with us. The Ronnie Scott Quintet Featuring Alan Skidmore is available on a Gearbox 12"LP. Find out more about Gearbox limited edition (500 copies) previously.unreleased vinyl records.